Some time ago I got into a discussion about whether it is possible to open transactions in the SAP GUI out of the browser. The opinion of the colleagues was unanimous – start SAP GUI from browser is something not be done. However I have maintained and created a small proof-of-concept. Because it works. Ok, it’s not pretty, but it works. 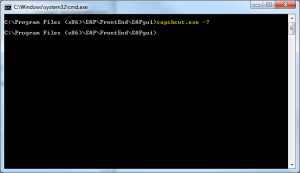 And that’s how to call the SAP GUI from the browser. No matter how frumpy SAP may look most of the time, nevertheless you can build such modern things like web services inside the SAP system. 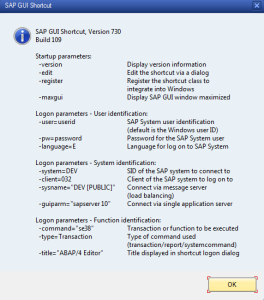 Even the WSDL (Web Service Description File) file can be generated in SAP. 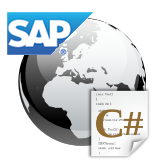 I read about this feature (WSDL generation) just at the right time, because recent days I should write a web service in SAP which should be triggered by a C# application. In .NET web services can easily integrated via their WSDL file by using the WebReference feature of Visual Studio. Therefore Visual Studio generates a so-called proxy class from the given WSDL file which can be used to call all functions of the webservice without thinking too much. When working with the ALV (ABAP List Viewer), the records/result-set displayed can be exported in various formats including those for spreadsheet programs. 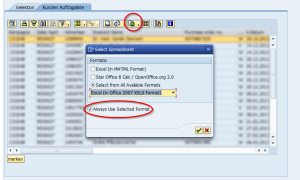 If you use this feature more often and always export your data into the same format, there does exist an option called “Always Use Selected Format” in the spreadsheet-export-dialog. If you check this option after selecting an export format, so in subsequent exports always the specified format is preselected and you won’t see the format selection dialog anymore. 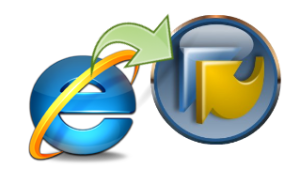 However, if you would like to change the format or want to get asked for he format again before every re-export, most users recognize that it isn’t such easy to revoke the “Always Use Selected Format” option.